When he reached the house, Harold braked by the implement shed, jumped out and, with head down against the driving rain, ran to the Bedford truck sitting in the end bay. It was quarter loaded with hay bales covered in a massive tarpaulin ready for the evening’s feed out. This green canvas cover was attached to the cross board behind the cab, stretched up over the bales and back to the rear of the tray. Leather straps held the sides onto steel rings protruding from the side of the wooden decking. Designed to protect the hay, it could bellow up or flap in the wind but would be secure. Harold leapt in, gave a grunt when he saw that the keys, as expected, had been left in, backed around and headed down the drive. He reached the school within moments, veered around so the Bedford was facing back towards the farm, left the motor running and tore into the senior room. The sudden sound of a male voice made Julie glance up to see Harold’s agitated face and waving hands. She had never seen him looking so apprehensive with eyes that darted back at forth at Courtney O’Reilly, the children and finally, herself. “For God sake woman, if that slip hits the school you’ll be buried alive. There’s no time to argue!” Harold yelled. Julie flushed white and turned to her teacher. “I believe him, Mrs. O’Reilly,” she said. “There is no time!” screamed Julie. Her face reddened and chin shook with emotion. “I will!” shouted Julie. 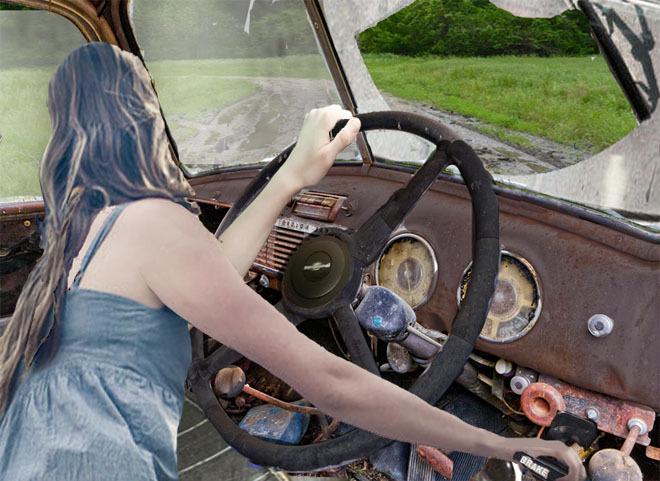 “I’ve driven it around the hay field.””No,” Courtney ordered but Julie disobeyed her second teacher in almost as many minutes, ducked behind Harold and ran to the driver’s seat. Courtney stared wide eye at him as if her courage had deserted her.